When Christmastime comes, there are often ugly Christmas sweater parties. It’s fun to see who sports the ugliest sweater and everyone has a good laugh. However, would you still be laughing if people wore the same style of sweaters in January, February, and March, or all year round? Or what if they wore them as part of their regular wardrobe at any time? Would it not seem out of place, even if well-intentioned? 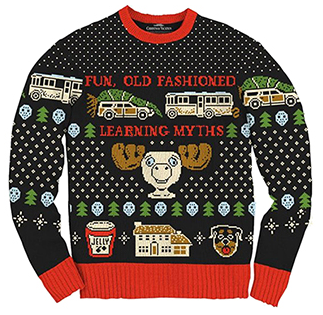 Learning styles have become like ugly Christmas sweaters of education. Yet, many people wear learning styles year round – not as a joke, but very seriously. And here is where the analogy diverges: Ugly Christmas sweaters are, for the most part, innocuous whereas designing instruction based on learning styles is not. But what could be wrong with learning styles? Here are two answers: First, they don’t work. That is, instruction that is matched to learners’ identified or preferred styles of learning does not lead to better learning. The results of many studies tell us this (Kirschner & van Merriënboer, 2013; Moore, 2015; Pashler, McDaniel, Rohrer, & Bjork, 2008; Thalheimer, 2015). Second, adhering to learning styles can impede learning (Kirschner & van Merriënboer, 2013; Pashler et al., 2008). Beyond the fact that the research does not support the claims about learning styles leading to better learning (Kirschner & van Merriënboer, 2013; Moore, 2010, 2015; Pashler et al., 2008; Thalheimer, 2015; Willingham, Hughes, & Dobolyi, 2015), the various advocates of learning styles each promote a limited number of learning styles. That is, there are different camps of learning styles, each with their own few styles that they have suggested. For example, Kolb, who has promoted learning styles for decades, has identified four styles (Kirschner & van Merriënboer, 2013; Kolb & Kolb, 2103) and then nine styles (Kolb & Kolb, 2103). While Kolb promotes some sound instructional design principles, the notion of adapting learning to four or nine learning styles would contradict the very idea that everyone is unique and learns in different ways. If there are only four styles, or nine styles, then everyone must be categorized into one of four or nine main categories. That does not sound very unique to me, unless you are the only person that fits in one of the categories and the other billions of people on earth fit into the remaining three or eight. On the other extreme, with each author identifying a few learning styles, the total number of these learning styles adds up to a huge amount (Kirschner & van Merriënboer, 2013). It has been pointed out that to follow the learning style argument through, it would mean that there are more learning styles than there are people (Kirschner & van Merriënboer, 2013). How could any designer or other educator possibly design for that many learning styles? They could not. Moreover, if there are as many learning styles as there are people, or even more, that contradicts the idea of principle-based instruction and learning – that there are universal principles that have application to everyone. Many principles of instruction and learning would have to be discarded if one truly accepted the notion of learning styles. Like ugly sweaters, learning styles have become big business (Kavilanz, 2015; Kirschner & van Merriënboer, 2013; Pashler et al., 2008). Look up learning styles in scholarly articles on Google or other databases. Research the movements and you will discover that people make presentations all over the country at big and small conferences, sometimes for a fee (Pashler et al., 2008). Look at Amazon and other places for books about learning styles. As of this writing, entering the term ‘learning styles’ in books on Amazon yields 40,193 results. People are making money from promoting learning styles that have no foundation in the scientific research. Ugly sweaters are now so popular during the holidays that you can design your own ugly sweaters (Kavilanz, 2016). At the website UglyChristmasSweater.com “people [can] create their own designs. You’ll never again show up to a[n] ugly sweater party wearing the same thing as someone else” (Kavilanz, 2016). 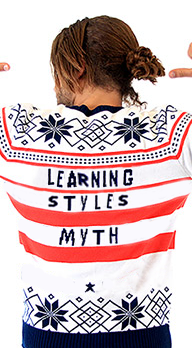 Like the individualized ugly sweater, the idea of learning styles sounds good. Perhaps it is the notion of uniqueness that people cling to – that every person is different and that we must identify his or her style of learning to truly be effective at helping them learn. I am of the opinion that teaching to someone’s proclaimed learning style may be damaging. Why? Because when an educator focuses dollars, energy, and time on learning styles, he or she crowds out dollars, energy, and time to create instruction based on principles and strategies that have been shown to improve learning. Perhaps more importantly, labeling people with a specific learning style can lead them to believe that very valuable and perhaps necessary instructional approaches don’t work for their individual styles. Instead of harnessing the power of a learner’s prior knowledge and experience (Kirschner & van Merriënboer, 2013; Merrill, 2002, 2013) and the value of a variety of learning approaches, only narrow, even hit-and-miss strategies may end up being emphasized with learning styles. You’ve heard it, haven’t you? “She’s a ‘hands-on learner!’” Or, “He’s a ‘visual learner.’” Should a visual learner stop reading books and only watch movies? Should an auditory learner stop exploring with his or her hands and instead expect that everything be made into sounds? Learners could become conditioned to reject instruction that does not fit with their style that, nevertheless, would dramatically move them along to becoming what they hope to become. There are strong feelings associated with learning styles (Moore, 2015). The widespread adoption of the learning styles movement is likely in part due to acceptance by those who don’t know better. They hear it from a teacher, administrator, professor, or even from a designer of instruction, and swallow it completely (Kirschner & van Merriënboer, 2013; Moore, 2015; Willingham et al., 2015). This does not excuse an individual from becoming informed about the research related to learning styles. Will Thalheimer has a standing offer for $5000 to anyone who can unequivocally demonstrate the validity of learning styles (Thalheimer, 2014). Feel free to prove him and the scientific world wrong. Until then, there are better places to spend your time and means to improve student learning. Moreover, you would help your reputation, and that of any institution you represent, by resisting the wardrobe of learning styles. Kolb, A., & Kolb, D. (2103). THE KOLB LEARNING STYLE INVENTORY- Version 4.0 A Comprehensive Guide to the Theory, Psychometrics, Research on Validity and Educational Applications. Merrill, M. D. (2002). First Principles of Instruction. Educational Technology Research & Development, 50(3), 43–59. Willingham, D. T., Hughes, E. M., & Dobolyi, D. G. (2015). The Scientific Status of Learning Styles Theories. Teaching of Psychology, 42(3), 266–271.